For a new shooter, the number of bullet types and terminology can be overwhelming and difficult to understand – and the full metal case is arguably the most confusing of them all. Typically, this bullet type is found labeled in the bulk ammo section of foreign manufacturer sites, and it's basically the same thing as the full metal jacket, or FMJ. Many gun authorities note that Remington was the first to use the description "full metal case." The full metal case style bullet is typically lead, fully covered in a super-thin layer of copper. Some companies use alternate covering metals or hybrids, and some bullets are made of lead and aluminum or other metals, giving the bullets very different ballistic properties. This can drastically change what happens when the bullet strikes a target, depending on whether more weight is at the front or rear – which can alter fragmentation properties as well. You can also find bullets that are specifically made for different uses. There are two advantages to full metal case style bullets. One is that they are economical, the second is that they shoot cleaner than other bullet types. While the average JHP cartridge is 20 to 50 percent more expensive than the average FMC, cleaner shooting is even more important for some shooters. This is because FMC bullets do not cause "leading" in the barrel of the gun, like some lead bullets can. When you jacket a bullet, the properties of that bullet change – they change in flight and also while inside the barrel of a gun. As a result, these bullets don’t expand very much, like soft points and the typical rounds you might be used to. And since there’s very little expansion,over- penetration issues as well as concerns about taking down game animals are common. Some FMC bullets will pierce a target and keep going, leaving a wound similar to being stuck with a very sharp spear. This can lead to more wounding as opposed to the kill shots that hunters look for in their ammunition. When one considers home and personal defense needs, the FMC can penetrate multiple walls and even appliances. Most self-defense authorities discourage using FMC ammunition for anything other than practice due to this over-penetration. 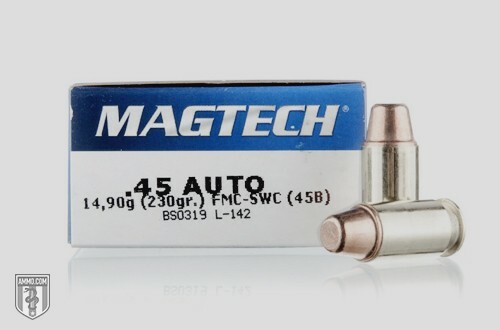 Overall, this is a very common type of bullet and is excellent for range use and training. Just remember that FMC and FMJ are almost always the same bullet, unless it clearly notes something special on the website or the box of ammo itself.